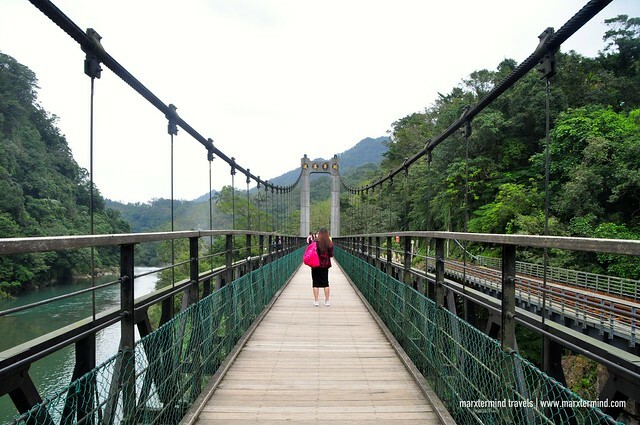 Located in the northern part of Taiwan, Shifen and Jiufen are two beautiful places to visit with spectacular scenery, ancient villages and wonderful attractions. Both are amazing places that if we had the time, we could have probably stayed for at least a day for each. Shifen boasts many beautiful waterfalls and other scenic attractions. Jiufen is a historic town filled with some amazing views and interesting alleys. 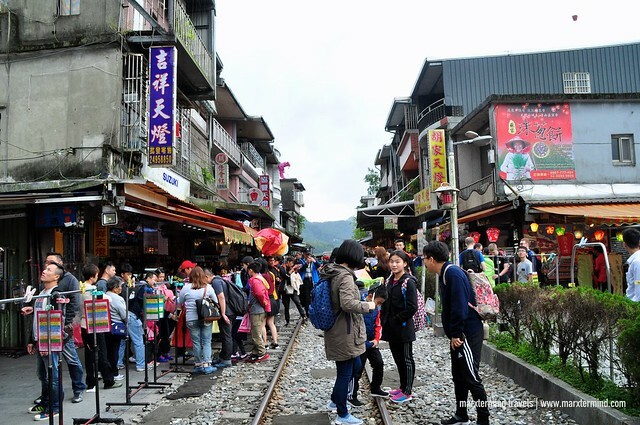 Shifen and Jiufen are both favorite destinations for locals and tourists alike. It’s a nice place to go even on a day trip. It’s a short drive from the capital city and accessible by taking either a train or bus. How to go to Shifen and Jiufen? 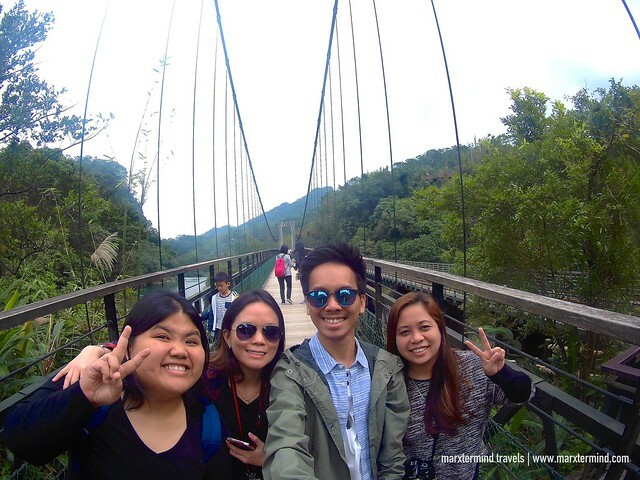 It was on our third day in Taiwan when we went to Shifen and Jiufen. We hopped on a train at Taipei Railway Station towards Ruifang. It is advisable to buy ticket in advance for a guaranteed seat, unless you wanted to stand for the entire journey. We didn’t know so we only bought ours on the day itself. Luckily, there were some unoccupied seats but we had to transfer from one seat to another. Some seats only become available depending where passengers board and alight. The train ride takes about 40 minutes. There are also shuttles buses from Taipei to get to Ruifang but train is faster and more comfortable. Once in Ruifang, get on the Pingxi Line train to go to Shifen but we opted to go by taxi. It was a 30 minutes drive. But on our return, we took the train. It was cheaper but the journey was a bit longer. 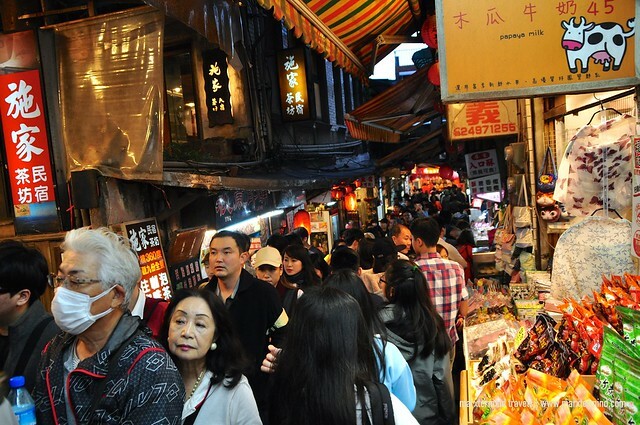 When going to Jiufen, there are also shuttles buses from Taipei leaving in the morning and returning in the evening. Buses are also available from Ruifang. There are also taxis but expensive. Since we were already running out of time when we arrived in Ruifang from Shifen, we opted to take a taxi. The ride was 30 minutes. If visiting Shifen and Jiufen for a day trip, most probably you’ll end up leaving either from these two places late in the evening already. Train might not be available that time anymote but there are still buses and taxis going back to Taipei. We left Jiufen around 7:00 PM. We took the bus but we waited for some time since there was a long queue. Also, buses bound to Taipei only arrive every other 20 minutes or so. Two main attractions to visit in Shifen are the waterfalls and the old street. We visited the waterfalls first. Coming from Ruifang, we asked our taxi driver to take us here. He dropped us at the main road/parking area and from there, we walked for 20 minutes to reach the waterfalls. The walk area was quite nice with some beautiful scenery. We also passed by a suspension bridge located beside the train track that we thought a good place for photographs. 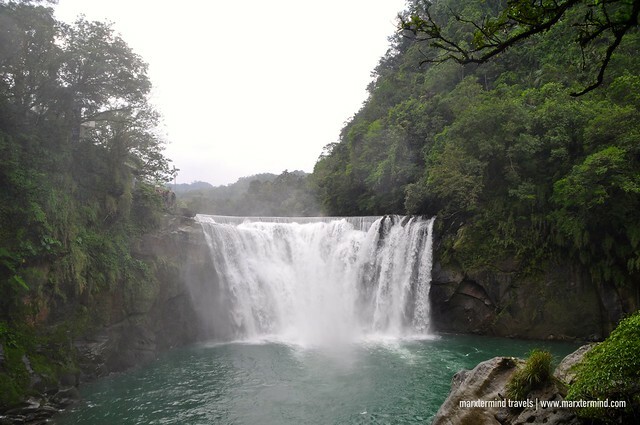 Shifen Waterfalls is one of the most famous in Taiwan. This 20 meter tall waterfall is also widely regarded as the most scenic in all the country. It creates a rainbow as it splashes into the lake. The waterfalls really looked majestic. It can be viewed in different angles from the several observation decks and platforms provided. The place can be touristy, but still looks absolutely stunning. We spent an hour in the area. Afterwards, we left and rode a taxi going to the old street. It was just a short drive. I saw some people walking, but I bet it would take time. Shifen Old Streets is a collection of lanes and alleys in and around the Shifen railway station area. There are plenty of souvenir shops and restaurants on both sides of the railway. It would have been nice to explore the alleys but we got no time. We visited Shifen Old Streets mainly because of the sky lanterns. 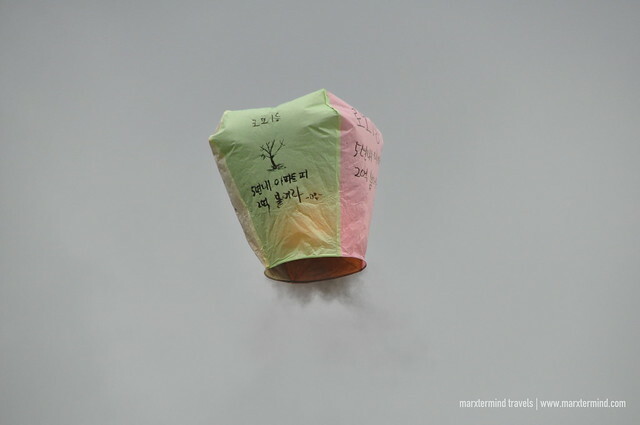 This is the only place in Taiwan where sky lanterns are allowed due to its sparse population and high altitude. Based on the colors, a lantern cost about NTD 200 (~USD 8). The colors represent a wish. We got one lantern for our group with 4 different colors. After writing our wishes, two guys assisted us to light the lantern and release it. It was a nice experience, I must say. And I hope all our wishes do come true. 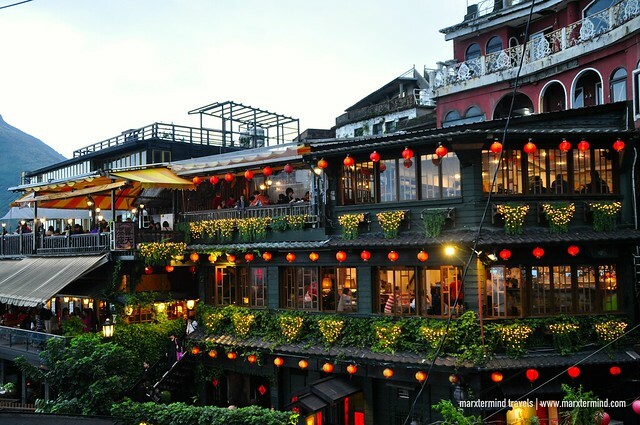 Jiufen is a favorite tourist destination located within the hills in northeast of Taiwan. The village is next to the mountain and facing the sea, offering a beautiful ocean view. 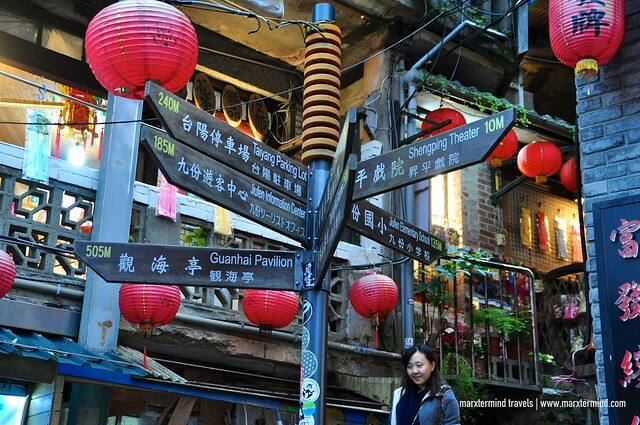 Jiufen is a maze of lanes and alleyways with rich history and culture. It is used to be the center of gold mining. Jiufen is also popular because of some movies that took place here. It also became popular due to its resemblance to the downtown in the anime movie Spirited Away. The place soon attracted more tourists. Jiufen Old Street is the most prosperous shopping district that goes through most of the village. It can be crowded most especially during weekends and at night. But it is still an interesting cobbled-stone old street with so many unique food and souvenirs to buy. It also boasts a variety of shops, restaurants, and cafés. There are shops selling snacks and various local dishes. There are also some stalls selling souvenirs, arts and historical items. Getting around the old street is a nice experience and provides a lot of photography opportunities. 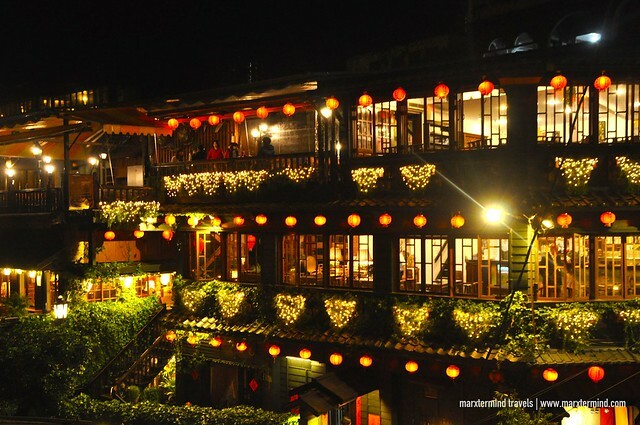 Another reason to visit Jiufen is because of Jiufen A Mei Tea House. 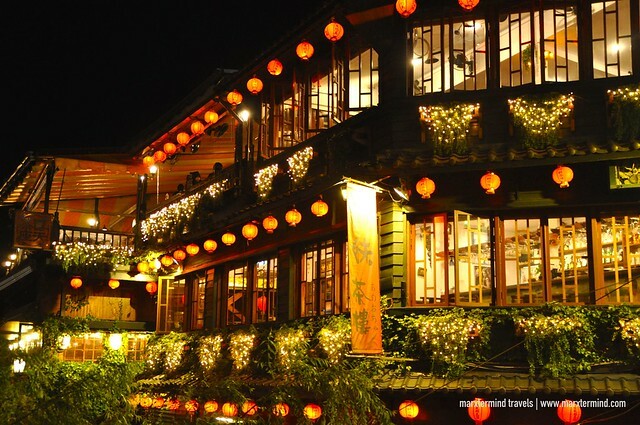 If you have watched the award winning animated film Spirited Away, then you’ll probably recognize A Mei Tea House. It was said to be the inspiration behind the lantern-lit bathhouse in the animation. The teahouse looks very picturesque with its red lanterns. A lot of tourists flock to this place and have that iconic Jiufen shot, which is normally seen in postcards. We went inside the teahouse to try their tea set. The teahouse is huge with several places to enjoy the tea. It has two floors that offer scenic views. We chose a table at the veranda on the lower floor. A standard afternoon tea set costs TWD 300 (~USD 9) per person. It comes with a small pot of tea and small portions of snacks such mochi, sesame crackers, sugared plums, and small bean cake. The price was sure expensive but we thought of trying it for experience. But what I loved about the experience was the waitress did a fantastic presentation about the tea with ceremony, preparation and all. It was a great experience to spend our day in Shifen and Jiufen. We had fun wandering around and enjoyed all the tourist spots that we visited. Definitely, it is a good day trip to do from Taipei. Disclosure: Please note that some of the links in this post are affiliate links, and at no additional cost to you, I will earn a commission if you decide to make a purchase after clicking through the link. For more information, see my disclosures here. Hi thank you for sharing this. is it possible to go these places in just half day? You might run out of time and might not be able to visit them all. I suggest spending a whole day for these places. Hello. Thank you for the detailed infos in visiting shifen. I would just like to ask how much did you pay for the taxi from ruifang to shifen waterfall? Also from shifen waterfall to old street?